Dr. Dillin’s laboratory works on the genetic and molecular mechanisms that regulate aging and aging-related disease. The Dillin lab is particularly interested in understanding why an organism begins to lose control over the quality and integrity of its proteins as it ages, and how the recognition of protein misfolding stress is communicated to distal tissues and organs. The lab utilizes emergent technologies to look at the manipulation of stress response pathways within a specific cell type or a single subcellular compartment within a specific cell type. In its research, the Dillin lab works with a variety of organisms, including mice and stem cells. However, the lab's historic roots are in working on the nematode C. elegans, a well-established model organism in aging studies. Dr. Dillin's laboratory is located on the fourth floor of the Li Ka Shing Center at the University of California, Berkeley. Above: Work in our lab has helped to uncover stress signals eminating from distinct subcellular stress responses in neurons. 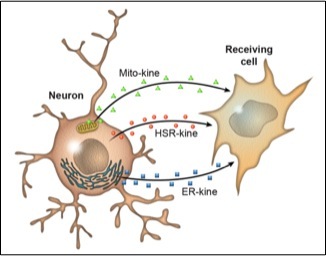 These signals, which can originate from the endoplasmic reticulum (ER-kine), the cytoplasmic heat shock response (the HSR-kine), or the mitochondria (the Mito-kine), converge on distal tissues to regulate aging and organismal homeostasis. Dr. Dillin’s laboratory is also a part of the Paul F. Glenn Center for Aging Research at UC Berkeley and UCSF, a joint venture between scientists at the two universities to understand how aging both accelerates and reciprocally is exacerbated by a loss in protein homeostasis and an increase in protein folding.